Wildlife officials in Washington say that gray wolves in the state are continuing to make a steady recovery as four additional packs were counted in a survey conducted over the course of last year. The finding brings the statewide total to 13 wolf packs -- a remarkable increase since 2008 when the first pack of wolves in 70 years was documented in Washington. The survey found more than 50 individual wolves, including five successfully breeding pairs, though officials say that number is likely even higher. "While we can't count every wolf in the state, the formation of four new packs is clear evidence of steady growth in Washington's wolf population," says Donny Martorello, carnivore specialist from the Department of Fish and Wildlife. 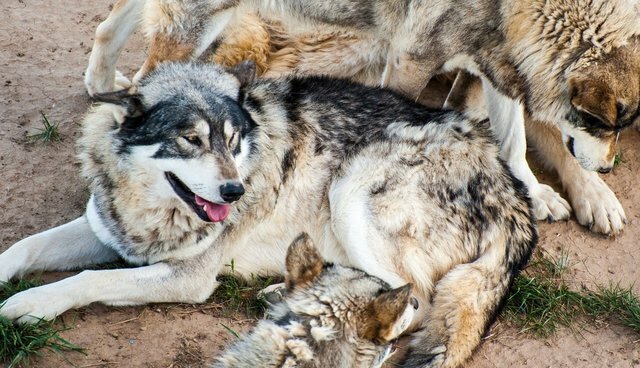 "More packs mean more breeding females, which produce more pups." Gray wolves were all but eliminated from the western United States last century, targeted as problem predators for attacking livestock. Since the mid-1990s, after wolves were reintroduced to Yellowstone National Park and granted protection under the Endangered Species Act, they have gradually expanded back into their native range, including Idaho and Oregon. Although the the number of wolves in Washington is higher, state officials say that the number of wolf attacks is actually down, with just one calf confirmed killed by wolves last year -- dispelling concerns voiced by ranchers that increasing wolf numbers would lead to more attacks. Federal protections for gray wolves in the U.S. is currently under review, with some legislators calling for the species to be delisted. Regardless of that outcome, Washington state officials say that wolf recovery plans there will remain in place until 15 breeding pairs are counted over three consecutive years.